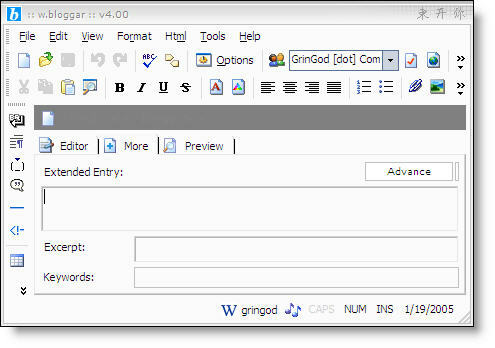 I’ve finally figured out how to send trackbacks when posting a blog entry with wBloggar. I’ve had trouble with this in the past and have had to go into my wordpress blog afterwards and re-post the entry manually adding the trackback urls. I knew that I had previously (about a month ago) found an advanced features window somewhere in wBloggar but it wasn’t until about five minutes ago that I found it again. Its hidden at the top right of the More tab in the main editor. In advanced options for the blog there is a textarea to allow you to enter urls to send trackback urls to. Now all I have to do is remember thats where it is. Although, it will probably be a while before I need to use it again so the chances are that I’ll forget it by then. 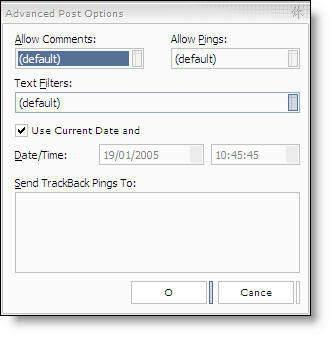 You can also go to TOOLS and then ADVANCED POST OPTIONS to ge to trackbacks a little quicker. So you can. I must have missed that one on my search through all the menus. Now, when the Mozilla version of wBloggar being released?